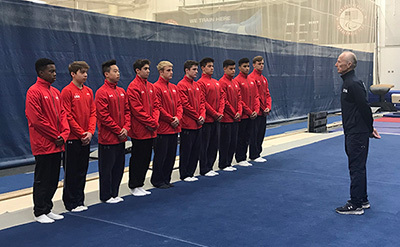 COLORADO SPRINGS, Colo., Dec. 3, 2018 – Eleven members of the 2018 U.S. Men’s Level 10 Junior National Team participated in a five-day training camp, Nov. 29-Dec. 3, at the U.S. Olympic Training Center in Colorado Springs, Colo. Under the direction of Dusty Ritter, the men’s Junior Olympic program coordinator, the athletes and their coaches focused on skill learning and evaluation, preparation for the 2019 competitive season and strength development. The gymnasts also performed routines, which will count as part of the selection process for the team for the RD761 Junior International Team Meet in Houston in January. The 11 gymnasts at the camp are listed below.